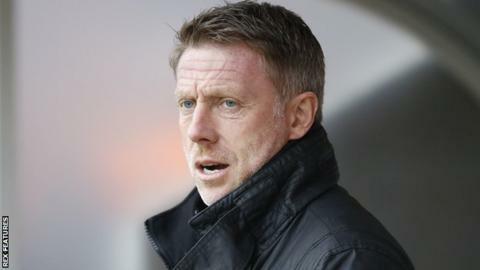 Hartlepool United are capable of starting another unbeaten run after Tuesday's League Two defeat by Carlisle, says manager Craig Hignett. Pools' seven-game streak was brought to an end at Brunton Park, after a run of five wins and two draws that brought a manager of the month nomination. Saturday's opponents Morecambe are just two points behind 17th-placed Hartlepool, with two wins in 15 games. "We've got no reason to be scared of anyone," Hignett told BBC Tees. "We've played well and looked difficult to play against, we just need to be more ruthless in the final third." Under Hignett, the Victoria Park club have climbed from 21st to sit 16 points clear of the relegation zone with seven matches left. In addition to the loss, Pools saw Billy Paynter limp off with a hamstring injury, with the striker a doubt for Saturday. "He's another one who has been fantastic," added Hignett. "He's a leader, great in the dressing room and he scores goals, so he'll be a big miss. "But it gives me a chance to see other people and that's what I've got to do before the end of the season."